Arthritis means “inflammation of the joints.” It is a general term for more than 100 conditions that affect an estimated 40 million Americans. Arthritis can strike at any age, causing varying degrees of pain, inflammation and limited movement. The condition restricts activity more often than cardiovascular disease, cancer or diabetes. Of the many types of arthritis, osteoarthritis is by far the most common. Although osteoarthritis rarely develops before age 40, nearly everyone by age 75 has some degree of the disease in their weight-bearing joints. Women are affected more often than men. Sometimes symptoms of osteoarthritis are mild – you may be unaware of the condition until it’s detected by X-ray. In other cases, severe involvement of your joints can make it difficult to do even the simplest activities – from brushing your teeth to putting on a sweater. Yet arthritis doesn’t have to keep you from doing the things you enjoy. By learning what you can do to control your symptoms, you can continue to lead an active and healthy life. Osteoarthritis attacks cartilage, a rubbery tissue that covers the ends of your bones and lies between joints. 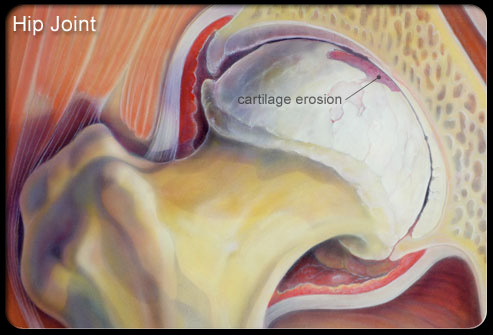 Cartilage is smooth, so your joints move easily, but firm and supple to absorb shock. Between the bones along your spine, discs made of fibrous tissue and cartilage keep your spine flexible and cushion your backbone as you move. As osteoarthritis progresses, surfaces of cartilage and underlying bone become compressed and irregular. Bony outgrowths called spurs may form. Instead of gliding smoothly, joint surfaces rub against each other. The result: stiffness and pain. Pain – Typically, pain is the earliest symptom. You may feel sharp pain when you use the affected joint, especially if you overdo it or have been inactive for a while. When you’re not moving your joint, the pain may subside. Stiffness – You’re most likely to feel stiff in the morning or when you stand. After about a minute or two, stiffness usually subsides. It’s unusual to lose complete movement in a joint affected by osteoarthritis. Sometimes, the source of pain isn’t apparent. For example, OA in your hip can refer pain toward your knee. Limited range of motion – You may find it more difficult to open a jar, peel fruit or sew on buttons. Inflammation – Redness and warmth occur more often in rheumatoid arthritis – a less common type of arthritis. But inflammation can also be a symptom of osteoarthritis. In osteoarthritis, your joint may become inflamed after excessive use. Or, redness and warmth may occur as an early symptom of the disease. Where does arthritis usually develop? Fingers – Bony knobs called “nodes” can enlarge your finger joints, creating a gnarled appearance. Early in the course of the disease, your joints may feel tender, painful or stiff. After one to two years, pain often subsides, leaving the bony knobs. 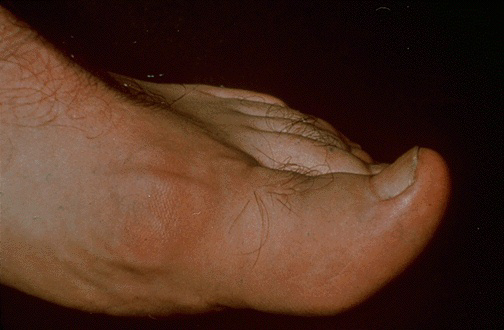 Heberden’s nodes, the most common type, affect the joints at the end of your fingers. They tend to run in families and affect more women than men. Usually, Heberden’s nodes take years to appear. But women in their 40s occasionally develop the bony knobs within a few weeks or months. Spine – Slow deterioration of discs between the bones along your spine can lead to back and neck stiffness. Weight-bearing joints – The parts of your body that bear the majority of your weight – your hips, knees and feet – are most susceptible to osteoarthritis. As cartilage slowly deteriorates over several years, you can develop chronic pain or varying amounts of discomfort when you stand and walk. Swelling may also occur, especially in your knees. A variety of over-the-counter (OTC) medications is available for the relief of arthritis pain. As with all medications, read the package labeling for proper use. Take medication only as needed until symptoms improve. If you have any questions, talk to your doctor. Acetaminophen – This nonprescription pain reliever is less likely than aspirin or other NSAIDs to irritate your stomach. However, acetaminophen (Aspirin-Free Anacin, Aspirin-Free Excedrin, Tylenol) doesn’t reduce inflammation. Nonsteroidal anti-inflammatory drugs (NSAIDs) – NSAIDs relieve pain. Higher prescription dosages can also reduce inflammation. To determine the right dosage, talk to your doctor. NSAIDs available without a prescription include ibuprofen (Advil, Motrin IB, Nuprin), ketoprofen (Orudis KT, Actron) and naproxen sodium (Aleve). Aspirin – Aspirin, a type of NSAID, is the oldest available nonprescription pain reliever. OTC brands of aspirin include Anacin, Bayer, Bufferin and Ecotrin. Like other NSAIDs, aspirin can reduce inflammation, but you might need up to 12 tablets a day. Plus, aspirin isn’t as gentle on your stomach as, for example, ibuprofen. Ask your doctor about the proper dosage for your specific condition. For occasional flare-ups, a cold pack often dulls the sensation of pain in the first day or two. Place ice in a plastic bag, then put the bag in a towel. Apply cold several times a day, but for no more than 10 minutes at a time. After acute pain subsides, a warm pack or a heat lamp relaxes muscles around a painful joint and may relieve symptoms better than ice. Limit each heat application to 10 minutes. Despite the many food fads connected to arthritis, none are proven to help or harm the condition. Eating a variety of foods, however, gives you the right mix of nutrients for good health. In particular, eating a varied diet emphasizing low-fat, high-fiber foods helps you maintain a healthy weight. Excess pounds add stress to your weight-bearing joints, worsening pain, stiffness and inflammation. Being overweight also increases your risk of developing osteoarthritis. If eating a variety of foods is difficult, talk to your doctor or a registered dietitian. A supplement with 50 percent to 100 percent of the Recommended Dietary Allowances for a variety of vitamins and minerals can ensure adequate nutrients. Don’t grasp or twist – For example, rest a book comfortably on your palms instead of pinch gripping its edges. Also, take advantage of a variety of household devices that minimize twisting, turning and gripping movements. Choose from vegetable peelers with thick rubber handles to specially designed jar openers and knives. Distribute your weight – Spread the weight of an object over several joints. For example, use two hands to lift a heavy pan. Favor large joints – Don’t push open a heavy glass door with your hands. Lean into it with your shoulder. Use good posture – When standing, pull in your stomach. Hold your shoulders back. Don’t slouch when sitting. Plan your moves – Think through each stage of your favorite activities. Then plan accordingly. When flying, for example, schedule a less crowded flight and ask for a seat that offers extra leg room. If you have a garden, plant in raised beds or install a window greenhouse to limit bending. Rest – Lie down or put your feet up periodically during the day. But avoid prolonged inactivity because it decreases muscle tone and overall health and fitness. Rest is essential to control active inflammation. But don’t let arthritis make you permanently inactive. A sensible exercise program may ease pain and avoid disability. Talk to your doctor or physical therapist about the types of exercise that are best for you. High-impact activities, such as jogging or basketball, are likely to put too much stress on your joints and make your arthritis symptoms worse. Your doctor may advise low-impact activities such as flexibility and strengthening exercises, brisk walking, swimming, biking, water exercises or cross-country skiing. Move with a slow, steady rhythm – Don’t jerk or bounce. Don’t hold your breath – This tires your muscles by depriving them of oxygen. Avoid exercising tender, injured or severely inflamed joints – If you feel joint pain, stop. Pain that persists for more than two hours after exercising often means you’ve overdone it. Rest and take an OTC pain reliever as needed until the pain goes away. Next time, break the activity into smaller segments, reduce the intensity or change the movement. If pain persists for more than a few days, see your doctor. Although there’s no cure for arthritis, don’t let the condition get the best of you. Be aware of key signs and symptoms. Then work with your doctor to plan a treatment strategy that helps you manage your symptoms to keep you active and independent.